Keep the oven off with these no bake healthy crispy balls. They are the perfect treat without the added guilt. Crispy peanut balls are so simple and easy to make – ideal for children to make as there is no baking involved and are fun to do. With the added crunch giving them a smooth texture that melts in your mouth, these balls are delicious! Crunchy, smooth and chocolatey in one bite. In a bowl crush the rice krispies so that you have of it in a powder form. In another bowl add in the peanut butter and honey and combine until mixed well. Melt your preferred chocolate with a little of coconut oil. Using a tooth pick dip your balls into the melted chocolate and cover. Place back into the fridge so that the chocolate sets hard. Store the balls in the fridge and eat when peckish. They make the best finger dessert. Just grab and go! Selsey Foods began its life as a herb and goat farm during the mid 1980’s in a small southern Cotswold village called Selsey. After some inspired thinking a range of speciality food products were produced using the herbs from the farm as a base ingredient, spices were later added to compliment the growing range. Although the goats have now gone they still produce the finest quality food and continually adding new exciting products. Selsey foods now have an online shop offering their customers a range of chutneys, sauces, preserves, traditional and seasonal food gifts, desert syrups and mulling syrups. All of their products are hand produced using the finest produce for the fullest and freshest flavours, only the very best ingredients, which coupled with the small batch runs and close attention to detail ensures that the products reach the consumer in excellent, mouth watering condition. We was recently sent some syrups to try out and they certainly went down a treat with our ice creams and pancakes. We received three bottles of syrup each a different flavour Vanilla syrup with a vanilla pod, blackcurrant and cinnamon syrup and sour cherry and vanilla syrup. The bottles are very attractive looking and are 250ml, without even tasting the syrup you instantly imagine them to taste sublime. We tried the syrups with out pancakes and icecream and the boys loved them, being an instant hit with the eldest as he has finished off the vanilla pod bottle using it on his porridge in the morning. The syrups are deliciously sweet and very tasty and i love the idea of having the vanilla pod inside the bottle. The flavours are strong and not a lot of the syrup is needed when pouring on to your food, the syrups make perfect addition to any food or drink. We added our syrups to porridge, ice-cream, pancakes, fruit, coffee, hot chocolate, milk to make milkshakes, deserts like sponge cakes and apple pie. the syrups are ideal to bake with aswell adding a little to enhance the flavour of the cake or pudding. Not only do the syrups taste nice in food and hot chocolate but adding a little to vodka or white wine really does give the drink an added flavour, they are ideal to make up cocktails too. Another syrup that we received was the Gourmet Mulling Syrup a non alcoholic syrup containing a special blend of spices to provide a simple and convenient way to make the most delicious mulled wine, cider or apple juice. Simply add to your chosen drink in an 8:1 ratio, heat and serve, being a sugar based product, it fully dissolves when heated and doesn’t leave any residue or powdery aftertaste. The syrup comes in a similar slimline bottle as the dessert syrups do but at 200ml. We added our syrup to the red wine adding segments of oranges to it, the drink went down really well and gave me that warming feeling. I also added a tsp into my coffee instead of sugar which gave it the delicious taste of the mulling herbs and spices but without the alcohol content. The syrups are available online at Selsey Foods costing £5.00 for a desert syrup and £3.50 for the mulling syrup. We was provided with some bottles of syrup for the purpose of this review. Inspired by a recipe from the cupcake heaven book. The cakes are moist and chewy with the mixture of banana and fudge, served with a squirt of fresh cream and extra cubes of fudge this cup cake will be a hit with children and adults. Beat the sugar and butter together until nice and creamy. Add the beaten egg, a little at a time until all combined add a spoonful of the flour. Fold in the banana and then sift in the flour, once all mixed add the cubed fudge. Keep some pieces of fudge to decorate the cakes with after. Spoon the mixture equally between the cupcake cases, i always use rubber moulds as i find it easier to get the cakes out after. This mixture should make about 8 cakes depending on the size of your moulds. Place into the oven for about 15 minutes. Once cooked place them onto a wire rack to cool down. To decorate squirt some cream on top or if you want you can use whipped double cream then top with some slices of banana and add some of the cubed fudge. 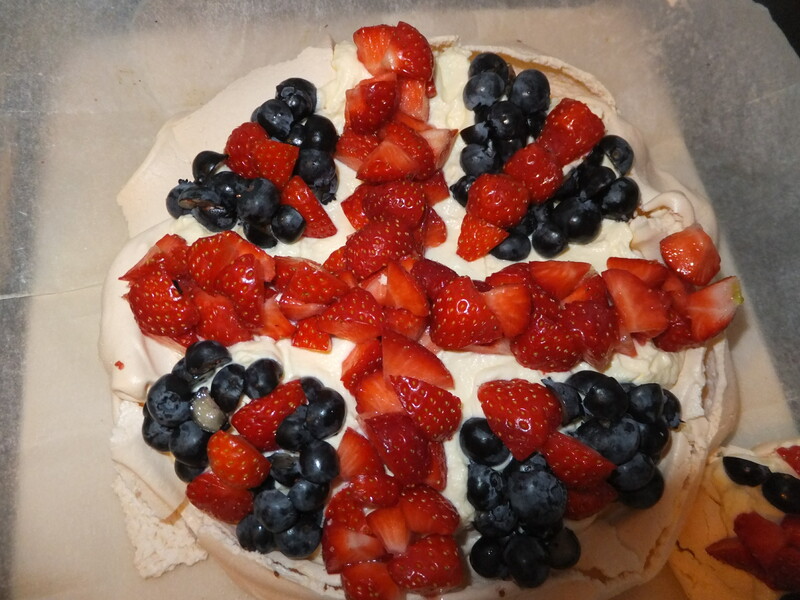 We teamed up our favourite dessert recipe with the olympics and came up with a Team GB Pavlova, made with strawberries, blueberries and cream to make the GB flag all topped onto a light crisp shell with a soft marshmallowy centre of a meringue. 2. Separate the eggs carefully, put the whites into a clean glass bowl, whisk the egg whites until they form soft peaks, this should take about 2-3 minutes. Add half of the sugar and carry on whisking until it has a nice glossy look to it and the mixture is nice and stiff. Gradually whisk in the remaining sugar, then add the vanilla essence, cornflour and vinegar, these are added to give the meringue the extra stability, whisk making sure they are all mixed in. 3. Once all whisked turn the bowl upside down, the meringue mixture should not fall out of the bowl. Using a metal spoon, turn the mixture onto the greaseproof paper, making a circle and ensuring that the centre is slightly hollow to allow the filling to placed there later. 4. 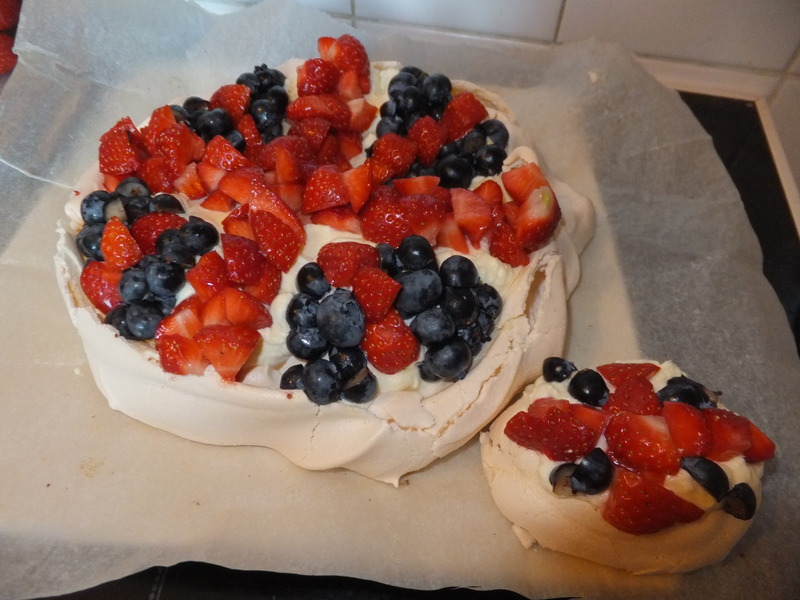 Bake for 1 hour or until the meringue is crisp on the outside and soft in the middle. 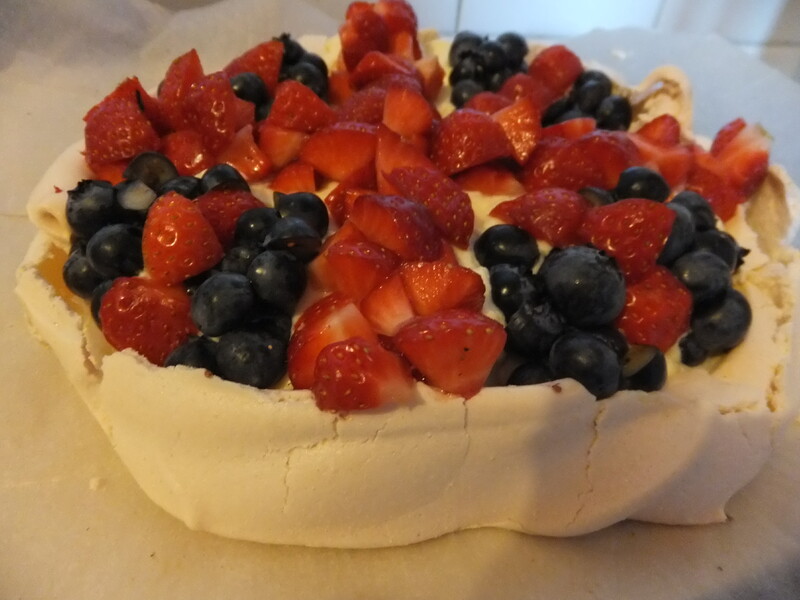 take out of the oven and place onto a serving dish, take care that the meringue doesn’t fall to pieces.